Since starring in CJ7 <長江7號> in 2008, Stephen Chow (周星馳) has not acted in any films. While many fans began speculating that he has transitioned into solely being a director, Stephen clarified that he still possesses the desire to act in movies. With a time travelling element to The Mermaid, the production incurred many problems along the way. Besides changing filming locations and ensuring the scenes are realistic – the cast and crew had to endure long hours working in the harsh cold weather. 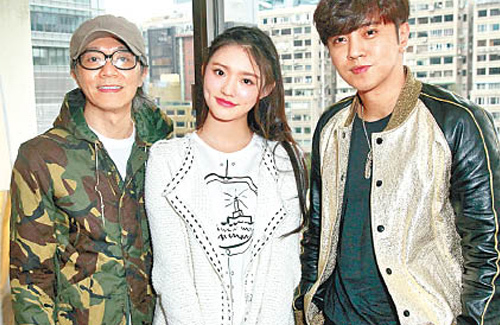 Directed by Stephen Chow and starring Deng Chao (鄧超), Show Luo, Kitty Zhang (張雨綺), and newcomer Lin Yun (林允), The Mermaid will open on February 8. The Mermaid will face competition from The Monkey King 2 <西遊記之孫悟空三打白骨精>, Crouching Tiger, Hidden Dragon 2<臥虎藏龍：青冥寶劍>, and From Vegas to Macau 3 <賭城風雲III>, which will also open during the Lunar New Year holiday. Would love to see Stephen in a movie again. He was awesome when he was an actor. His ego got to him and no one dares to cast him with his attitude towards people. I grew up with Stephen Chow… its definitely something I wanna see again especially a comedy, please nothing serious! Comedy is Stephen Chow trademark! I love Show Luo’s portrayal of the Lonely Scholar in Stephen Show’s ‘Journey to the West: Conquering the Demons’. He was super hilarious in it. I look forward to seeing him again in ‘Mermaid’. I hope his scene is not just that one short scene in the trailer.